On Thursday, with two more days left in September, we realized I could bake one more batch of wild bread this month. Aha! I KNEW there was a good reason that I have insisted on using whole wheat flour to create and feed our starter! And it is lovely and active. So, naturally (no pun intended), we want to use it to make bread! Because, after all, people were making bread long before jars of commercial yeast were readily available to the general public. And, of course, people continued to make lovely bread without commercial yeast after that time as well. This recipe comes from The Ladies Indispensable Assistant, 1850. To Make Good Yeast Take as many hops as you can hold in your hand twice; put them into three pints of cold water; put them over the fire, and let them boil twenty minutes: then strain the water into an earthen or stone jar, and stir in while the water is scalding hot flour enough to make a stiff batter: let it stand till about milk-warm: then add a tea-cupful of old yeast to make it rise, and a tea-spoonful of salaeratus dissolved in the old yeast; stir it well and put the jar in a warm place to rise. Some add Indian meal enough (after it has rise well) to make it into cakes and dry it on a board in the sun. This is very convenient, especially in hot weather, —a small cake soaked in a little warm water is enough to make a large pan of dough rise. Salaeratus (alternative spelling for “Saleratus”): Aerated salt; a white crystalline substance having an alkaline taste and reaction, consisting of sodium bicarbonate. Nine years after Pasteur’s discovery, Fleischmann’s® Yeast was founded, and the modern baking era was born. Commercially produced yeast first appeared in the United States in the 1860s. Charles and Maximillian Fleischmann, immigrants from Austria-Hungary, with the financial backing of James Gaff, patented and sold standardized cakes of compressed yeast (S. cerevisiae) produced in their factory in Cincinnati. By the early twentieth century factory-produced live cake yeast was widely available. Active dry yeast was developed by the Fleischmann’s company during World War II so that the U.S. Army could make bread without keeping yeast refrigerated. Partially dehydrated and formed into granules, it contains dormant yeast cells that keep at room temperature for several months. […] Instant yeast (aka quick-rise yeast) was first manufactured in the 1970s. Until commercial yeast for bakers was invented at the end of the nineteenth century, […] all bread was raised with yeast captured and cultivated in a simple mixture of flour and water. For at least two thousand years, people routinely and exclusively used this mixture, commonly known as sourdough, to make bread. I have successfully converted our plain naan recipe from one using commercial yeast into one that is raised with wheat levain that took just 5 days to create. I have great hopes that more bread recipes – calling for commercial yeast and converted to using wild yeast – will follow. So, here I am, armed with our bubbling natural starter made with 100% whole wheat flour, going full circle, having grown up with using active dry yeast for bread-making. Sometime near the end of the last century, I found a source (expensive…) of fresh yeast and tried it. I liked it but it was so expensive! I also tried instant yeast (by mistake because I didn’t read the label correctly at the supermarket) around that time. Aside from the brief disastrous sour sour flurries with wild yeast in 2007 and again in 2012, I’ve been firmly attached to using active dry yeast. I had no idea until I was beginning to write this post that active dry yeast didn’t appear on supermarket shelves until after 1945! Because we feel certain that most people in Asia probably DON’T use commercial yeast to make naan, we thought that would be a perfect one of our recipes to alter back to its original state. Naan […] originates from Central Asia […] [I]n India it is round and mostly made in a tandoor. At Vij’s, we don’t use a tandoor to bake our naan and it is a labour-intensive process. Since it’s not easy to make naan at home, we suggest you buy it premade from Indian grocers. Naan is a leavened flatbread shaped like a teardrop. It is best when cooked in the clay oven called a tandoor. Naan […] is the Central Asian word for “bread”. In South Asia, it has come to mean the leavened tandoor-baked flatbreads that evolved from the breads brought to the Subcontinent by the Moguls. I did make wild naan a couple of weeks ago, but it was before I had grasped the need to make sure the starter floats. Late on Thursday night (around midnight) I put a spoonful of culture from the fridge into a smallish bowl and stirred in equal parts (by weight) of whole wheat flour and water. I covered the bowl with a plate and put it in the oven with only the light turned on. Yesterday morning, as we were making coffee, I checked to see if the starter was floating. With Julia Child’s sage words “you are the boss of that dough” echoing in my head, I stirred in a little more whole wheat flour and water. So we could have coffee at our leisure. After coffee, I checked for floating again. Bingo! It floated. So I mixed the dough and over the course of the next couple of hours, folded and turned until the dough was beautifully soft and silky. Then I made what might have been an error. I put the covered bowl into the fridge. I haven’t quite gotten used to the kitchen not being stinking hot and humid…. I checked the dough at around 17:00 and it hadn’t budged. Oh oh! Into the oven, with only the light turned on, it went. And, miracle of miracles, it had almost doubled by 19:15 when T went to turn on the barbecue. I shaped the dough into six naans. T placed them directly on the grill, closed the lid, and a few moments later when he opened the barbecue to check on the bread, we were thrilled to see that every one of them had puffed. Whoohooooo! I’ve said it before and I’ll say it again: making naan is NOT a labour-intensive process. It’s one of the easiest breads to make – with or without commercial yeast. And it’s even easier to make if it’s baked directly on the grill of a gas barbecue (they are also easy to bake in a conventional electric oven). Starter Late in the evening on the day before you will be making naan, put a spoonful of active culture from the fridge into a small bowl. Stir in 45g water and 45g whole wheat flour. Cover with a plate and put into the oven with only the light turned on to leave overnight. Actual Dough In the morning of the day you will be making naan, take a small spoonful of the starter and see if it floats in a bowl of lukewarm water. If the starter is bubbly but the little amount sinks, stir in 10g whole wheat flour and 10g room temperature water. Cover with a plate and put the bowl back into the oven with only the light turned on. About 30 minutes later, check to see if the mixture floats. It probably will. Proceed with making the actual dough. Using a bowl that is large enough for the dough to triple, cut the butter into smallish pieces and place it in the bottom (I use a large casserole dish). Pour boiling water over top, stirring to melt the butter. Add the yoghurt to the butter water. Using a wooden spoon, stir in whole wheat flour and the rest of the all-purpose flour. Doublecheck that the dough is no warmer than baby bottle temperature, then add the starter to the large bowl. Sprinkle the salt overtop. Stir just enough to mix it together. Cover with a plate and leave on counter for about 20 minutes. Kneading: Wash your hands and leave one hand wet. With the back of your hand against the side of the bowl, reach down into the bowl to the bottom of the dough and pull it up to the fold it over the top. Turn the bowl with your other hand and repeat 4 or 5 times. Cover the bowl with a plate and set aside on the counter for about 20 minutes. Repeat the previous step 2 or 3 times more. You’ll notice that the dough is beginning to rise and that it is smooth and silky to the touch. Proofing: Cover with a plate and leave on the counter. If it’s very warm in the kitchen, and put it into the fridge until about an hour before you plan to bake the naan. If you are using the oven: 20 minutes before baking the naan, put baking stone on the middle rack of the oven. Turn the oven to 400F.If you are using the barbecue: 10 minutes before baking the naan, turn the barbecue on high. There is no need to put a baking stone in the barbecue. You can cook naan directly on the grill. Baking in the barbecue: Arrange the shaped bread directly on the hot grill and close the lid to the barbecue. Cook for about 2 minutes or so on one side, turn over when they have puffed. (Use blunt-nosed tongs so as not to pierce any holes in the naan.) Continue to cook on the other side until they seem done – complete baking takes about 5 minutes. Put the finished naan into a basket. Serve immediately with Indian curry, or butter chicken, and/or Palak Paneer (spinach and cheese). We think these naan are the best we’ve ever made! We served them with stir-fried apples, Swiss chard and cauliflower greens, and butter not-chicken (using left-over grilled pork). Dinner was wonderful!! 1 > Total the weights of the flour and water in the recipe. 2 > Multiply the flour and water total by 30 percent to get the amount of starter needed. 3 > Since the starter is one-third water and two-thirds flour (by weight), divide the total amount of starter by 3 to get the amount of water it contains and by 1 1/2 to get the flour. Subtract those amounts from the total water and total flour in the dough. […] (Obviously there is no need to use a sponge starter, as the sourdough starter provides all the flavor needed.) You can also replace the biga (and yeast) in a recipe with equal volume or weight of stiff sourdough starter. i) Pick the recipe you would like to bake, note the amount of fresh yeast that is called for and double it to get the amount of [natural starter] you need. Weigh this out in a bowl. ii) Take 25% of the flour that is called for in the recipe and put that in the bowl too. iii) Take half as much water as you took of flour and put that in the bowl. […] Mush it all together with your hands, cover it and leave it overnight or all day on the counter. Write down how much flour and water you used because you will need to subtract that from the total amount called for in the recipe and use the balance the next day. 3. Bake some sourdough bread: Bake, bake, bake. 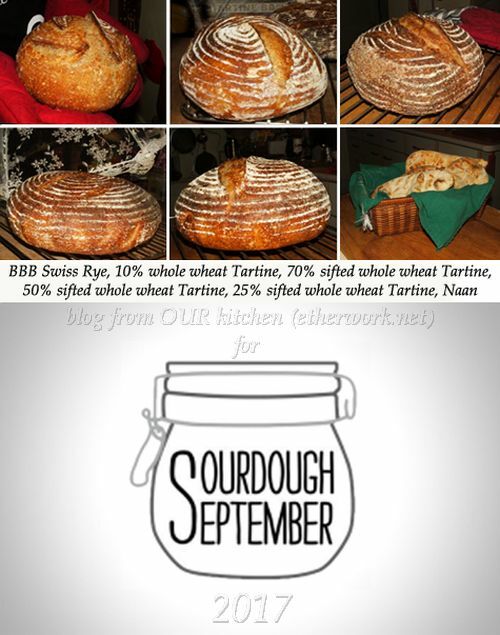 This entry was posted in baking, bread - yeasted & unyeasted, bread recipe, food & drink, posts with recipes, sourdough and wild yeast on Saturday, 30 September 2017 by ejm.